The bestselling author of The Particular Sadness of Lemon Cake returns with a wondrous collection of dreamy, strange, and magical stories. Truly beloved by readers and critics alike, Aimee Bender has become known as something of an enchantress whose lush prose is “moving, fanciful, and gorgeously strange” (People), “richly imagined and bittersweet” (Vanity Fair), and “full of provocative ideas” (The Boston Globe). In her deft hands, “relationships and mundane activities take on mythic qualities” (The Wall Street Journal). AIMEE BENDER is the author of the novels "The Particular Sadness of Lemon Cak"e--a "New York Times" bestseller--and "An Invisible Sign of My Own," and of the collections "The Girl in the Flammable Skirt" and "Willful Creatures." Her works have been widely anthologized and have been translated into sixteen languages. She lives in Los Angeles. "The Color Master offers 15 new tales that dazzle, confound, electrify, disturb, incriminate and empathize. It is sympathetic toward cake that cannot die and hopeful about the healing arts of darkness. It is absurd. It is remarkable. It induces mental whiplash...And it's so vividly imagined, so unusual, that those of us who read books with the hope of encountering language and ideas we haven't encountered before will feel -- well, we'll feel heard." 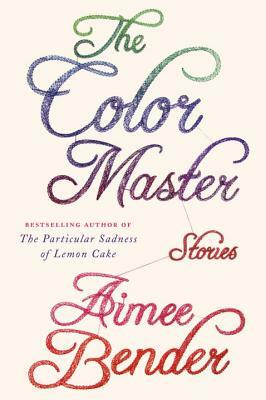 "Full of humor, wit, and pathos, The Color Master is the work of a writer with a strong, distinctive point of view, and with enough confidence to let it lead her into fresh and exciting places." "All these stories made my mouth water." --Alan Cheuse, NPR's "All Things Considered"
"Bender became a bestselling novelist with The Particular Sadness of Lemon Cake, but her new collection returns readers to her real forte: short stories that combine gnomic postmodern prose with whimsical fairy tale reveries...[T]he best stories are mood pieces about the mysteries of female friendship ('Bad Return') and bittersweet pageants populated by mall-worshipping adolescents ('Lemonade'), still fanciful but so light on gimmick that the reader senses -- like the lovelorn atheist in 'The Doctor and the Rabbi' -- 'the realization that there were many ways to live a life.' Many ways to write a life too, and Bender colors them with a tincture out of dreams. The world is everywhere present in this collection, but it gets the moon in, too." "Stories that range from fairy tales to quasi-erotica, all showing Bender's versatility...Bender's gifts as an author are prodigious, and with each story, she moves the reader in surprising, not to say startling, ways." "In the lively pages of Aimee Bender's dazzlingly dreamlike new story collection, The Color Master, Asian tigers split their skins and are mended by specially trained seamstresses; a woman who is 'ugly, by human standards,' falls in love with a man-eating giant she meets in a tavern; and random gifts, including cans of lobster bisque, materialize out of thin air, perhaps delivered by ghosts. These fantastical elements season the soup of Bender's savory and sublime human sagas...So many of Bender's sentences both settle and unsettle, and deserve to be read aloud for pure pleasure." "In Aimee Bender's short stories, the value of life is measured in terms of goodness, succulence and simplicity, all qualities that can be tasted, chewed and ultimately swallowed by the mouth or the mind." "This is Bender at her best, using her signature style to reveal (and perhaps overcome) the obstacles that keep us from understanding each other." "Bender has an extraordinary gift for drawing readers into her magical, mesmerizing tales, and those looking to lose themselves in fiction will not be disappointed."